The Greek federation organized an unforgettable evening for the members of the national team after their historical success. Greece won two medals at the European championship on Schwechat. 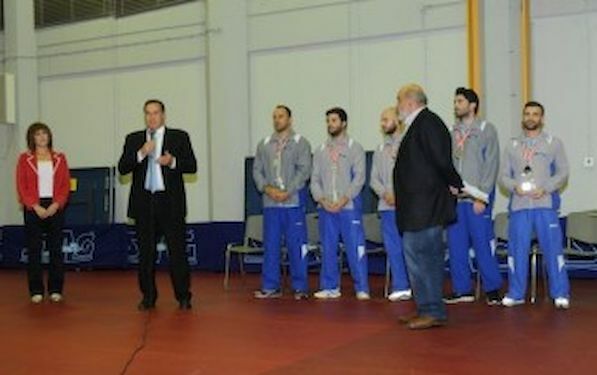 About 500 people gathered in STAG area of Peace and Friendship Stadium and greeted the team that clinched the silver medal in the team’s event and bronze in singles by Panagiotis GIONIS. It was a glittering evening, which was attended by people who have helped and continue to help the sport in various positions. Current and former international athletes, coaches, parents of athletes, fans, all came to shake hands Kalinikos KREANGA, Panagiotis GIONIS, Kostas PAPAGEORGIOU, Tasos RINIOTIS and federal coach Kostas VATSAKLIS for historical success. Moreover, the excitement of the evening shared with people in the sport by many representatives of the political life of the country. Showed great interest and media (four television channels, journalists and photojournalists attended the meeting), while the entire celebration was broadcast live on the Internet (from the site sportshero.gr)! The beautiful scenery included balloons in white and blue color, great shots of athletes and the coach on the walls, a variety of photographs and posters for autographs, music and large buffet after the close of the celebration. President of H.T.T.F Manolis KOLYMPADIS presented a simple and brief event, referred to the impressive performances of the team and added that the conditions are auspicious for the future of national team. Then one by one the athletes and in the end the coach appeared at the main entrance of the hall to accept the applause and enthusiastic cheers of the crowd. The president of Hellenic Olympic Committee Spiros KAPRALOS and the General Secretary of Sports Kiriaki GIANNAKIDOU gave the awards to the athletes. Athletes honored Manolis KOLYMPADIS generally for longtime support for their efforts and especially for significant support to the European Championship in Austria, where he was head of mission. At the end of the feast the players signed hundreds of autographs and photographed with fans.